The fine folks at MailChimp have released a free graphic design tool called Pictaculous. 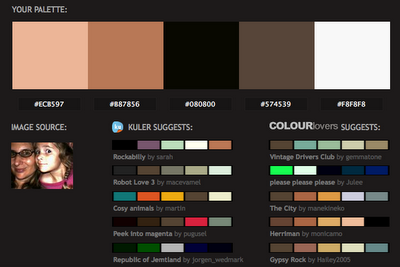 Simply plug an image into Pictaculous, and different sets of compatible color palettes are generated. A nice little tool to help you with your print or web projects! Try it out for yourself on the Pictaculous website. That's very cool, thanks for the link. The variety of suggested palettes provides a lot of options depending on the energy or tones you want to emphasize. I've used Kuler before, but for that you have to type in an html color code.